Spring is such an inspiring time of year. With the (hopefully) warmer weather and all the new growth it’s as though a new lease of life is breathed into everything, and for anyone interested in food this time of year is surely a real joy. I sometimes get a lull in my food writing and recipe development for the book – I’m not always in the right frame of mind, sometimes creativity escapes me, sometimes I’m just plain tired – but these past few weeks I’ve been full of ideas and very active in the kitchen. But then, how could you not be with all the new produce becoming available – asparagus, herbs, new potatoes, spring onions, spinach, etc, etc – and with the sun shining and the warmer weather prompting us to fling windows and doors wide open and drag out the barbecues and picnic baskets? One of my new favourites, which are making more and more of an appearance these days, are pea shoots; the delicate yet very flavoursome leaves of the pea plant. 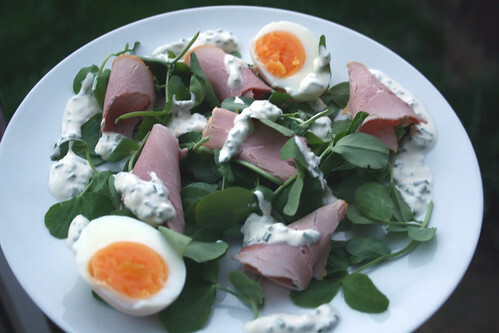 They’re a real beauty in salads, such as this very simple one which I put together recently, consisting only of hard boiled eggs and ham with the pea shoots, and dressed with a mix of snipped chives and crème fraîche. Even if the sun doesn’t always want to come out to play, you can always find a little bit of sunshine in a salad such as this. So simple but so delicious. I tried pea shoots for the first time last year and loved them, but making my boyfriend guess which veg they came from on taste alone was the highlight! I’ve never heard of pea shoots. That’s another one to ask my Mum and Dad about. The salad looks great and so simple. That looks DELICIOUS! I’ve used pea shoots only as a green in asian hot pot cooking. What a great salad alternative! Love pea shoots but don’t eat them often enough. This recipe looks simple and delicious. I LOVE salad! Looks divine! Pea shoots are fabulous and so tasty! I have just put up a pea shoot recipe by Mark Hix on my blog. That looks so delicious, I love ham and egg together! I saw a bag of pea shoots the other day and was wondering how best to use and this looks ideal! We eat with our eyes. Very pretty. Have been following your post for a while and have decided to leave my first comment. Your food looks great, mouthwatering even, and your ideas are very refreshing. I have chosen you to tag on my site to enable others to discover your site. I’m sure they will like it just as much as me. Thanks for all your lovely comments, as always. Hello fram France again, your salad has just made my mouth water, it is evening and I was wondering what to prepare? Pea leaves? I have never seen or tasted them before? They do look delicious, the peas are really fat over here at present I bought some today to go with the pan-fried trout, but- no leaves! This is so simple, yet delicious! Totally scrumptious! This is something I’ve never had. Your salad is lovely. Makes me want to try them. I love pea shoots too Julia and am pleased to see them becoming more widely available. Love them for salads and also with fish.